The rusty nail is the ultimate in scotch cocktails and if you are interested in that style of whiskey, this is a drink you should be familiar with. The best part is that you can choose whichever Scotch whiskey you like and make it as top-shelf as you wish. Don't worry, you will not be wasting a great scotch by mixing it into a rusty nail. The cocktail is very simple and it is the ideal drink of choice for any scotch lover. In it, you will simply mix scotch and Drambuie over ice. It is designed to be a sophisticated, slow-sipping drink and in that regard, it is one of the best you will find. Pour the ingredients into an old-fashioned glass with ice cubes. Some drinkers prefer a lemon twist garnish, though the rusty nail is often ungarnished. You may also consider serving it over a slow-melting ice ball to reduce dilution and retain the drink's full flavor. A blended Scotch whiskey is typically used in the rusty nail. You just want to be sure that it is a good one because the rusty nail deserves it. Choose one of the mid- to high-end bottles like Johnnie Walker Black Label or Chivas Regal 12 YO and save the $20 whiskeys for other drinks. Just because blended is preferred, don't rule out a single malt scotch. The Glenlivet 12 and 15 YO expressions are fantastic and there are many other great options available. Every regional nuance in single malt scotch will come out in the rusty nail and it's a perfect mixed drink for exploring new bottles. Of course, these can be quite costly and may be one of those rare indulgences, though your rusty nail will be worth every sip. Cost is going to be a big factor when ordering a rusty nail at the local cocktail lounge as well. It is important to keep in mind that if you 'call' a premium whiskey for this drink, you will be charged a premium price that is probably not listed on the menu. Many drinkers have been surprised by their tab because of this and if your budget is a concern, go with the well scotch. There really is no good substitute for Drambuie. It is a liqueur from a proprietary recipe of honey and spices with a scotch base and its taste is unlike any other liqueur on the market. As much as you can play with the scotch in this cocktail, it will no longer be a true rusty nail without Drambuie. That said, having Drambuie in your bar is not a bad thing. Not only can you enjoy a rusty nail any time you please, but it can also be useful in a variety of other cocktails. Plus, it's fabulous on its own or with ginger ale and at 80-proof, you will not even miss the whiskey. As with many simple classic cocktails, the proportions of the two ingredients will depend on your personal taste. The 2-to-1 ratio given in the recipe is a good starting point, though many rusty nail fans enjoy 3-to-1 (2 ounces scotch and 1/2 ounce Drambuie). Also, as you explore more scotches, you will find that adjustments should be made for each. How Strong Is the Rusty Nail? 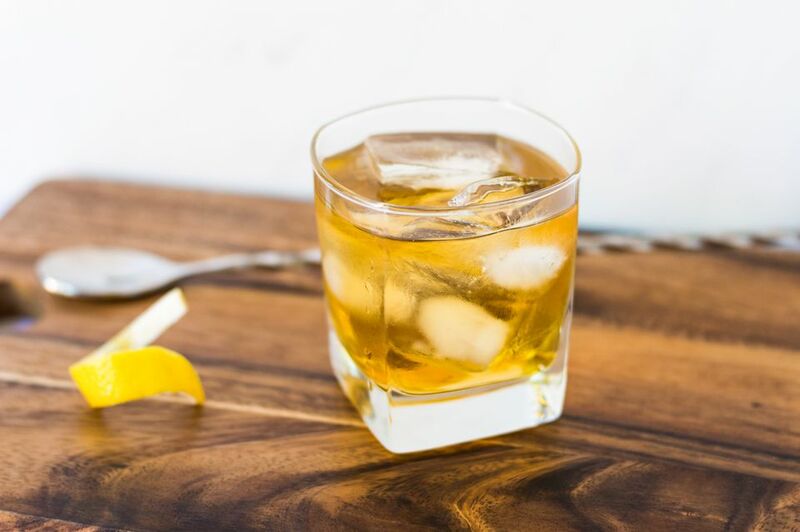 The rusty nail is typically made with two 80-proof liquors though your scotch may be stronger than that, depending on which bottle you choose. This means that this is not in any way a light drink, in fact, it's probably one of the strongest cocktails you can make. That's great because it means that it is full of flavor (not just alcohol). If you run the numbers to estimate the Rusty Nail's alcohol content, it comes in at around 33 percent ABV (66 proof), which is slightly lower than bottling strength. This estimate uses the recipe as written above and if you choose to pour a stronger scotch in a 3-to-1 mix, it will go up from there. Ginger Ale or Beer? How Will You Take Your Mamie Taylor?